UPDATE 9.40PM: SEVERE Tropical Cyclone Debbie has slowed slightly and is looming off the Queensland coast. TC Debbie is forecast to directly impact Airlie Beach, Hamilton Island, Prosperpine, Bowen and the Mackay region about from 11am tomorrow morning before tracking further inland and dissipating. The dangerous system currently has sustained winds near the centre of 165km/hr and wind gusts up to 230km/hr. The very destructive core of tropical cyclone Debbie is forecast to cross the coast between Ayr and Cape Hillsborough (north of Mackay) on Tuesday morning with wind gusts potentially to 275 km/h near the centre of the system. BOM warn heavy rainfall is expected to impact Central Queensland tonight. "Areas of heavy rain with the potential to cause severe flash flooding have developed around the central coast and Whitsundays and are expected to spread to other parts of the northern and central Queensland coast and adjacent inland areas tonight and continue through Tuesday," forecasters say. "Widespread daily rainfall totals of 150 to 250 mm, with isolated event totals of 500 mm, are also likely to lead to major river flooding over a broad area next week, and a Flood Watch is current for coastal catchments between Rollingstone and Gladstone, extending inland to the Upper Flinders, Thomson and Barcoo catchments." UPDATE 8.10PM: Severe tropical cyclone Debbie has intensified to category 4, according to the latest update from the Bureau of Meteorology. TC Debbie has sustained winds near the centre of 165 kilometres per hour with wind gusts to 250 kilometres per hour. It is now located within 30 kilometres of 19.5 degrees South 149.8 degrees East, estimated to be 170 kilometres east northeast of Bowen and 195 kilometres north northeast of Mackay. TC Debbie is moving west southwest at 9 kilometres per hour. Severe tropical cyclone Debbie has strengthened into a category 4 system. It may intensify further as it continues to move west-southwest towards the north Queensland coast tonight. Severe tropical cyclone Debbie is forecast to make landfall between Cape Upstart and Cape Hillsborough (north of Mackay) on Tuesday morning. UPDATE 7.55PM: THE latest information from the Bureau of Meteorology is that Tropical Cyclone Debbie will make landfall at 10am tomorrow. The outer edge of the severe weather system is expected to encapsulate Mackay over the next few hours. "This is probably the largest evacuation we've ever had to do," Premier Annastacia Palaszczuk told Ten News in reference to a mass evacuation order presently in place for Mackay. .
"This is going to be a monster of a cyclone." UPDATE 3.30PM: AN EMERGENCY alert has been issued for Mackay as Cyclone Debbie continues to strengthen. Emergency Alerts for a storm surge have been issued by Mackay Regional Council for the areas of: North Pioneer; South Pioneer; Louisa Creek; Armstrong's Beach; Dunrock; Ball Bay; Freshwater Point; Grasstree; Half Tide and Seaforth. Council has advised of a storm tide warning which may impact the Green, Red and Orange zones on Monday evening and Tuesday morning. It comes as Premier Annastacia Palaszczuk, the State Disaster Coordinator Deputy Commissioner Steve Gollschewski and the Queensland Fire and Emergency Services Commissioner Katarina Carroll prepare to update the media on the situation. CYCLONE Debbie is growing more powerful, more quickly, with the system forecast to become a Category 4 tonight, seven hours earlier than expected. Debbie was not due to toughen up until it reached landfall on Tuesday morning, but it appears the system has slowed down to build up strength. It is due to strike land close to Bowen at 9am, with Debbie spending up to four hours over land before weakening enough to become a Category 3 system as it heads west towards Collinsville. 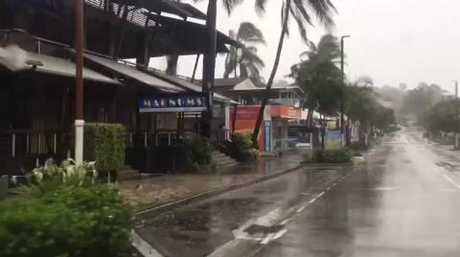 The BOM reports that Whitsunday Islands are already being buffeted by gale-force winds, which are expected to soon spread from Townsville to St Lawrence. Cyclone Debbie's "very destructive core" is expected to cross the coast between Ayr and Cape Hillsborough north of Mackay, with wind gusts of up to 240kmh near its centre. WHEN Cyclone Debbie makes landfall on Tuesday, those in its path will cop winds of almost 280kmh, enough to blow away caravans, uproot trees and bring down powerlines. 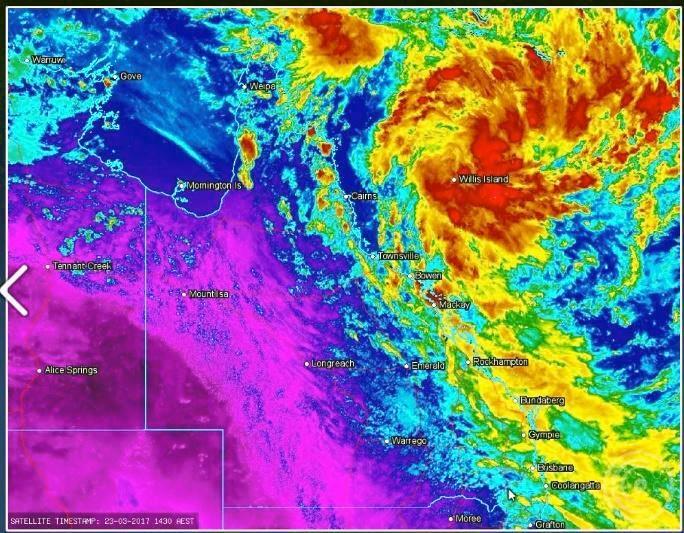 Already Whitsunday islands are being buffeted with 100kmh winds, and these will worsen as Debbie marches west and builds from a Category 3 to a Category 4 system. Even now as she continues to strengthen, she is delivering wind gusts topping 165kmh. When she reaches the coastline, the strongest wind gusts from Debbie could hit 279kmh. The force of that will tear down power lines, trees will be uprooted, caravans blown away or tipped over "dangerous airborne debris" will become a deadly threat. For comparison, Cyclone Tracey was a Category 4 when it devastated Darwin in 1974. The cyclone will cross the coast travelling at 10kmh, meaning the most powerful winds and rain could linger over those in the path for hours, or even a day, if the entire width of the 560km storm passes over. BOM meteorologist David Crock said as Debbie's eye passes over, there is a chance of the clouds clearing for a few moments. "If the cyclone is well developed, the sun will come out for a few minutes as the eye passes over," he said. But when the storm rambles on, the winds topping 220kmh will return. LATEST UPDATE 11AM MONDAY: TROPICAL Cyclone Debbie has strengthened to a Category 3 system and moved closer to the Mackay region. The BOM's latest update shows TC Debbie has significantly moved further south and is now forecast to hit south of Bowen. BOM say TC Debbie is expected to intensify further as it continues to move west-southwest towards the Queensland coast today. 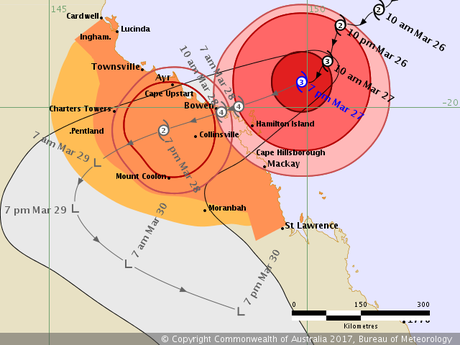 "Severe Tropical Cyclone Debbie is forecast to make landfall as a severe tropical cyclone between Ayr and Cape Hillsborough, north of Mackay, on Tuesday morning," forecasters say. "The very destructive core of tropical cyclone Debbie is forecast to cross the coast between Townsville and Mackay on Tuesday morning with wind gusts potentially to 240 km/h near the centre of the system. "Widespread daily rainfall totals of 200 mm, with isolated falls of 400 mm, are also likely to lead to major river flooding over a broad area next week, and a Flood Watch is current for coastal catchments between Cardwell and Gladstone, extending inland to the eastern Gulf River catchments." UPDATE 10AM MONDAY: Premier Annastacia Palaszczuk, the State Disaster Coordinator Deputy Commissioner Steve Gollschewski and the Queensland Fire and Emergency Services Commissioner Katarina Carroll will provide a live update of TC Debbie soon. UPDATE 8AM MONDAY: TROPICAL Cyclone Debbie has shifted further south and is now predicted to cross the coast closer to Bowen. In the past few hours, TC Debbie has moved 15km south and 10km east and is now estimated to be 390km east of Townsville and 270km east northeast of Bowen. BOM say Debbie is expected to continue moving west-southwest towards the north Queensland coast while potentially developing into a severe (Category 3) tropical cyclone today before crossing the coast tomorrow morning around 7am. Areas of heavy rain with the potential to cause severe flash flooding are expected to develop about parts of the northern and central Queensland coast and adjacent inland areas later today and continue tomorrow. BOM's MetEye predictions also show the tropical low following TC Debbie tracking even further south, now extending through Maroochydore before heading back out to sea. The next update will be provided at 11am. Monday 8.30am Met Eye track map. UPDATE 6.30AM MONDAY: RAIN has started to soak areas of Central and Northern Queensland as Tropical Cyclone Debbie approaches the coast from the Coral Sea. More than 40mm has fallen in areas such as Mackay and Hamilton Island and wind gusts over 90km/hr have been recorded in those areas. Further south, Yeppoon is also starting to feel the fringes of Debbie with 12mm of rain recorded since about 9.30pm as well as wind gusts in excess of 50km/hr. Cyclone Debbie forming in the Coral Sea. It's a shadow of what's to come for the Central Queensland region though, with TC Debbie and her following rain depression expected to dump up to 400mm or more across the region over the next week. As at 5am, Cyclone Debbie remained a Category 2 system but is expected to strengthen to a Category 3 today before increasing to a Category 4 for landfall tomorrow morning. BOM have this morning extended the track of the Tropical Low which will follow Debbie, with MetEye predictions showing the system travelling as far south as Maryborough. Cyclone Debbie is expected to cross the coast near Ayr before travelling inland to Charters Towers then becoming a rain depression heading through Central Queensland. BOM warn Cyclone Debbie is predicted to continue moving west-southwest towards the Queensland coast while potentially developing into a severe tropical cyclone today. "Tropical cyclone Debbie is forecast to make landfall between Rollingstone and Proserpine on Tuesday morning," forecasters say. "Gales are now occurring about the Whitsunday Islands, and are expected to extend to the exposed coast and islands elsewhere between Ayr and Mackay this morning. "Gales could extend to remaining coastal and adjacent inland areas between Lucinda and St Lawrence later today before potentially extending further north to coastal areas between Innisfail and Lucinda on Tuesday. "Destructive winds with gusts over 125 km/h may develop about the exposed coast and islands between Ayr and Mackay later this morning. "The very destructive core of tropical cyclone Debbie is forecast to cross the coast between Rollingstone and Proserpine on Tuesday morning with wind gusts potentially to 230 km/h near the centre. "Destructive winds and gales could extend inland to Charters Towers, Mount Coolon, and Pentland later tomorrow as the weakening cyclone moves inland." RESIDENTS near where Cyclone Debbie is expected to make landfall should prepared for conditions to "deteriorate rapidly", Sky News Weather meteorologist Tristan Meyers has warned. While he noted conditions remained relatively mild in area close to Mackay and Bowen, he urged residents "not to let that fool you". Currently, Tropical Cyclone Debbie is a category two system with wind speeds of 110kmh and gusts up to 155kmh about 475km east of Townsville. But already, gusts had reached 69kmh at Mackay. "We're going to see gales develop - gales are wind gusts over 90kmh - they're going to develop this afternoon (Sunday) and into this evening, we're already starting to see those," Mr Meyers said. "In addition to that we'll also see heavy rain and showers, (and) potentially embedded storms develop around that entire region into tonight." LATEST UPDATE 6.30PM: TROPICAL Cyclone Debbie is tracking towards the Queensland coast and is expected to make landfall on Tuesday morning. According to BOM, is currently forecast to intensify into a category 3 system this evening and is likely to continue on a west south-west track and intensify further prior to making landfall between Rollingstone and Proserpine. "Gales are expected to develop about the exposed coast and islands between Ayr and Mackay during this evening, and could extend to remaining areas between Lucinda and St Lawrence during Monday," BOM say. RAIN FALL: Parts of Queensland are expecting a deluge. "Gales could extend further north to coastal areas between Innisfail and Lucinda during Monday evening or Tuesday morning, as well as further inland to Charters Towers and Mount Coolon. "Destructive with gusts over 125 km/h may develop about the exposed coast and islands between Ayr and Mackay during Monday morning, before extending further northwest to Lucinda by the evening. "The very destructive core of Tropical Cyclone Debbie is currently expected to cross the coast between Rollingstone and Proserpine on Tuesday morning, most likely as a Category 4 tropical cyclone, with wind gusts up to 260 km/h near the centre." BOM warn abnormally high tides are expected to occur south of Proserpine on the high tides on Monday. 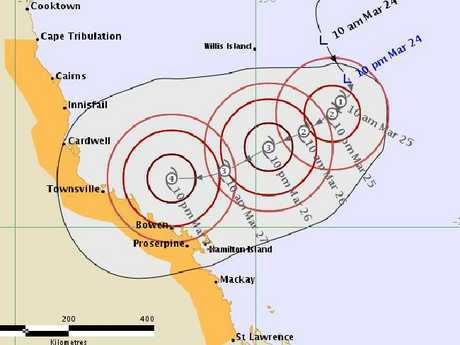 "On Tuesday, residents between Rollingstone and Mackay are specifically warned of the dangerous storm tide as the cyclone crosses the coast," forecasters say. "The sea is likely to rise steadily up to a level well above the normal tide, with damaging waves and flooding of some low-lying areas close to the shoreline as the cyclone approaches the coast on Tuesday. "Large waves may also develop along the beachfront. People living in areas likely to be affected by this flooding should take measures to protect their property as much as possible and be prepared to follow instructions regarding evacuation of the area if advised to do so by the authorities." Areas of heavy rain with the potential to cause severe flash flooding are expected to develop throughout northern and Central Queensland on Sunday and continue through the week. "Widespread daily rainfall totals of 200 mm, with isolated falls of 400 mm, is also likely to lead to major river flooding over a broad area next week, and a Flood Watch is current for coastal catchments between Cardwell and Gladstone, extending inland to the eastern Gulf River catchments," BOM say. RADAR images at the Bureau of Meteorology show catchments feeding the Fitzroy River are expected to receive a deluge. New radar images from BoM suggest large areas of the Fitzroy catchment are expecting more than 400mm over the next eight days. But most of it is expected to fall over the next few days as Cyclone Debbie steams through Central and north Queensland. Every river catchment from Cairns to Gladstone has been placed on "Flood Watch". BoM hydrologists are currently briefing authorities and emergency personnel, and reviewing forecasts for floods, but are expected to release their latest flood information at about 12.30pm. LATEST 10AM SUNDAY: TROPICAL Cyclone Debbie has intensified and moved further south overnight according to the latest BOM update. Just after 7am the BOM issued a revised advice for TC Debbie, with forecasters predicting the system will strengthen to a Category 3 system today. Forecasters say TC Debbie is likely to intensify further prior to making landfall between Lucinda and the area north of Mackay on Tuesday morning. BOM say hazards of TC Debbie include gales, destructive winds, a very destructive core, abnormally high tides and heavy rainfall. "Gales are expected to develop about the exposed coast and islands between Ayr and Mackay during this afternoon or evening, and could extend further south to St Lawrence tonight," forecasters say. "Gales could extend further north to coastal areas between Cairns and Ayr on Monday or during Tuesday morning, as well as further inland to Charters Towers and Mount Coolon. "Destructive winds with gusts over 125 km/h may develop about the exposed coast and islands between Ayr and Mackay as early as Monday morning, before extending further north to Lucinda by the evening. "The very destructive core of Tropical Cyclone Debbie is currently expected to cross the coast between Townsville and Proserpine on Tuesday morning, most likely as a Category 4 tropical cyclone, with wind gusts up to 260 km/h near the centre. 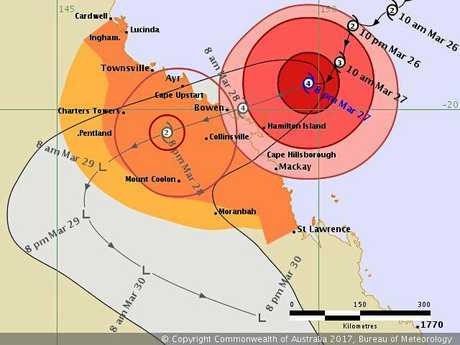 "Abnormally high tides are expected to occur between at least Lucinda and Mackay as the cyclone approaches the coast. Large waves may also develop along the beachfront. "People living in areas likely to be affected by this flooding should take measures to protect their property as much as possible and be prepared to follow instructions regarding evacuation of the area if advised to do so by the authorities. "Areas of heavy rain with the potential to cause severe flash flooding are expected to develop about parts of the northern and central Queensland coast and adjacent inland areas late on Sunday and continue through Monday and Tuesday. "Major river flooding may also develop over a broad area next week and a Flood Watch is current for coastal catchments between Cairns and Gladstone, extending inland to the eastern Gulf River catchments." UPDATE 5.30PM SATURDAY: COMMUNITIES from St Lawrence north of Rockhampton to Ayr south of Townsville are officially in the firing line for Cyclone Debbie. A revised Bureau of Meteorology cyclone update shows Cyclone Debbie has moved further south and is expected to cross the Queensland coast further south than first anticipated. BOM forecasters have cancelled the 'Watch Zone' from Cape Tribulation to Cairns, with a Watch Zone now in place for Cairns to Ayr. The first official 'Warning Zone' has been issued which extends from Ayr down to St Lawrence including Bowen, Mackay and the Whitsunday Islands. BOM forecasters say TC Debbie is continuing to show signs of development with sustained winds of 65km/hr near the centre and gusts up to 95km/hr. "The system has been relatively slow moving during today, but is expected to adopt a steady west-southwest track in the next few hours," forecasters say. "This general west-southwesterly motion is expected to continue for the next few days, bringing the cyclone towards and eventually onto the north Queensland coast. "Conditions are expected to favour the continued intensification of the cyclone as it approaches the coast over the weekend and into early next week. "Tropical Cyclone Debbie is expected to cross the coast between Townsville and Proserpine on Tuesday morning, most likely as a Category 4 tropical cyclone, with wind gusts up to 260 kilometres per hour near the centre." BOM say destructive winds are likely to develop about the Whitsunday Islands and nearby coast on Monday night while gales are expected to develop between Ayr down to St Lawrence on Monday afternoon. "Based on the current forecast track, abnormally high tides are expected to occur between at least Lucinda and Mackay as the cyclone approaches the coast," forecasters say. "Large waves may also develop along the beachfront." BOM warn heavy rainfall could begin in Central Queensland as early as tomorrow. "Areas of heavy rain are expected to develop about parts of the northern and central Queensland coast and adjacent inland areas into Sunday," BOM say. "A Flood Watch is current for coastal catchments between Cooktown and Mackay, extending inland to the eastern Gulf River catchments." People between Cairns and Ayr should consider what action they will need to take if the cyclone threat increases. The next advice is due to be issued by 8pm. TC Debbie track map as at 4pm Saturday. UPDATE 4PM SATURDAY: THE BUREAU of Meteorology has heightened warnings of heavy rainfall across Central Queensland as a result of Tropical Cyclone Debbie. TC Debbie officially formed in the Coral Sea this morning and is expected to cross the Queensland coast sometime between Sunday night and Tuesday. Queensland Regional Director Bruce Gunn said heavy rainfall is likely to continue well into next week for northern and central Queensland, warning flooding could occur. "This rainfall comes on the back of significant recent rainfall around Mackay, where catchments are already susceptible to flooding," Mr Gunn said. "Localised flash flooding is also likely, and the public is urged to exercise caution if caught in a heavy downpour and never walk, ride or drive through floodwaters." A Flood Watch has been issued for coastal catchments between Cairns and Gladstone extending inland to the eastern Gulf Rivers. Catchments at risk within the Flood Watch area include the Barron, Russell, Mulgrave, Johnstone, Tully, Murray, Herbert, Ross, Bohle, Black, Haughton, Burdekin, Don, Proserpine, Pioneer, Fitzroy, Calliope, Mitchell, Gilbert, Norman and Upper Flinders Rivers and Bluewater Creek. Mr Gunn warned communities between Cape Tribulation and St Lawrence may start to feel the effects of TC Debbie by tomorrow. "Based on current modelling, the most likely scenario is for Cyclone Debbie to make landfall near Townsville, a little further south than the first advice issued," Mr Gunn said. ""The intensity will depend on how much time the cyclone spends over the water, with current modelling suggesting the system will intensify to severe tropical cyclone strength Category 4 [on a scale of one to five, with five being the highest]. "Although the strongest winds are near the core, damaging and destructive winds can extend several hundred kilometres from the cyclone's centre." Mr Gunn also warned storm surge is a risk factor. "If the cyclone crosses the coast on the high tide, this will enhance these effects," he said. UPDATE 11AM SATURDAY: TROPICAL Cyclone Debbie has officially formed off the Queensland Coast. In a TC Advice update issued just before 11am, the Bureau of Meteorology say TC Debbie is a Category 1 system producing wind gusts close to 100km/hr. "The tropical low over the central Coral Sea has recently developed into Tropical Cyclone Debbie," BOM meteorologists said. "The system has been moving slowly southwards overnight, but has recently shown signs of shifting onto a west-southwest track. "This general west-southwesterly motion is expected to continue for the next few days, bringing the cyclone towards the north Queensland coast. "Conditions are expected to favour the continued intensification of the cyclone as it approaches the coast over the weekend and into early next week." The TC Debbie 'watch zone' extends from Cape Tribulation down to St Lawrence, about 186km north of Rockhampton. The system is currently located about 650km east of Cairns and 580km east northeast of Townsville and is moving southwest at 9km/hr. BOM forecasters say sustained winds of 65km/hr have been recorded near the centre of TC Debbie as well as wind gusts of 95km/hr. 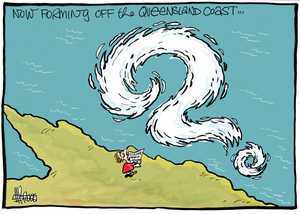 They warn of gales off the QLD coast tomorrow and high tides. "Gales are not expected to develop about the Queensland east coast today, however they could develop about the coast and islands between Cape Tribulation and St Lawrence, including the Whitsunday Islands, during Sunday," forescasters said. "Based on the current forecast track, abnormally high tides are expected to occur between at least Lucinda and Mackay as the cyclone approaches the coast. Large waves may also develop along the beachfront." BOM say Central Queensland should prepare for heavy rain, with falls potentially beginning tomorrow. "Areas of heavy rain are expected to develop about parts of the northern and central Queensland coast and adjacent inland areas into Sunday," forecasters said. The next cyclone update will be issued by BOM by 5pm. UPDATE 6:30am: According to a late-night update from the Bureau of Meteorology, Cyclone Debbie has been upgraded and is expected to cross the coast as a Category 4 intensity system. Debbie is set to be the most powerful cyclone to hit Queensland in two years, with residents preparing for winds of up to 224km/h, according to the Courier-Mail. BOM expects Debbie to reach the coastline somewhere between Proserpine and Townsville some time around 10pm on Monday. >> Don't miss an update, click here and hit follow topic to subscribe to Rockhampton weather stories. UPDATE: 6.30pm: CYCLONE watch has been extended to Central Queensland town of St Lawrence as tropical low intensifies off the coast. Communities between Cape Tribulation and St Lawrence, including the Whitsunday Islands, may begin to be affected by this expected tropical cyclone during Saturday evening or Sunday morning. People between Cape Tribulation and St Lawrence should consider what action they will need to take if the cyclone threat increases. LATEST: THE BUREAU of Meteorology have issued their first official warning as Cyclone Debbie continues to form off the Queensland coast. While no 'warning zone' has been issued, BOM say the 'watch zone' is from Cape Tribulation to Proserpine, including the Whitsundays. BOM says the tropical low has been showing signs of strengthening and has been moving towards the south. "During Saturday the low is expected to develop into a tropical cyclone and adopt a track towards the west, bringing it towards the north Queensland coast," BOM forecasters predict. "Conditions are expected to favour the continued intensification of the system as it approaches the coast over the weekend." BOM says coastal communities could be affected by the cyclone as early as tomorrow. 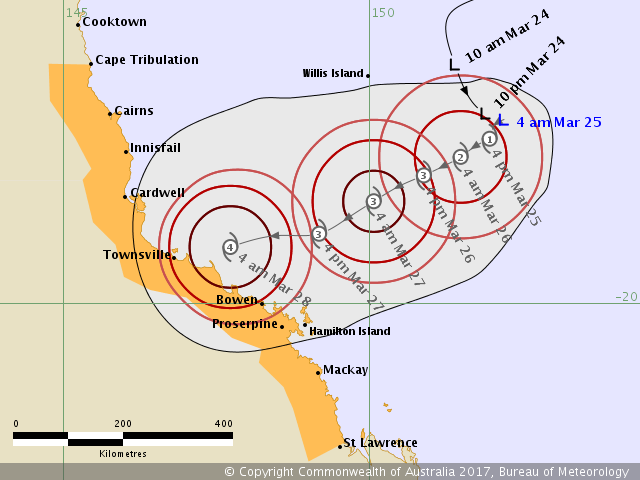 "However, given the expected intensification of the low and the forecast track towards the coast, coastal and island communities between Cape Tribulation and Proserpine, including the Whitsunday Islands, may be affected by this expected tropical cyclone during Saturday evening or Sunday morning," forecasters say. Intensity: Tropical Low, sustained winds near the centre of 45 kilometres per hour with wind gusts to 85 kilometres per hour. Location: Within 110 kilometres of 16.1 degrees South 151.4 degrees East, estimated to be 610 kilometres east of Cairns and 600 kilometres northeast of Townsville. Movement: South at 15 kilometres per hour. Gales are not expected along the coast in the next 24 hours. People between Cape Tribulation and Proserpine should consider what action they will need to take if the cyclone threat increases. The next BOM Tropical Cyclone update will be issued by 5pm. INITIAL: WE MAY be enjoying a few hours of sunshine, but prepare to be soaked again next week with predictions up to 200mm could drench Capricornia as Cyclone Debbie hits Far North Queensland. 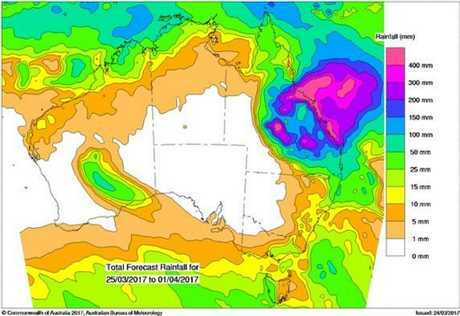 While computer modelling suggests it's extremely unlikely the cyclone could cross the coast as far south as Rockhampton, the region is expected to still receive heavy rainfall. Sky News chief meteorologist Tom Saunders told The Morning Bulletin the exact landfall location was still unknown, but Debbie, roughly the same size as Cyclone Marcia, looked likely to hit between Cairns and Townsville early next week. Rockhampton and the Capricorn Coast can still expect to be impacted. It comes on the back of a week of heavy rain, which saw flash flooding and roads closed as upwards of 200mm hit Capricornia. "Just because the centre isn't going through the central part of the coast, doesn't mean we won't feel the effects," Mr Saunders said. "We are expecting rain to increase over the weekend. 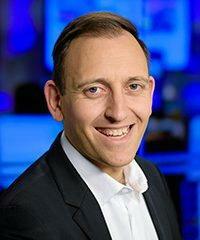 "Of course, we've already had heavy rain this week, it's sort of eased off temporarily. "But as the system moves closer towards the coast on Sunday, we will expect the rain to start increasing." After making landfall early next week, models indicate Cyclone Debbie will hover over western Queensland. Mr Saunders said this would generate heavy rain over the tropics and the west, with Rockhampton sitting on the southern edge of the system. "It is tricky at this stage picking how much rain will fall at the central coast," he said. "But for the Capricornia district, there's certainly the potential there for another 100-200mm over the next week." Rain over the western part of the state will be a welcome relief in drought-affected regions. While this may say isolated flooding, similar to this week, Mr Saunders said it was unlikely to produce moderate to major flooding along the Fitzroy River. "For widespread flooding along the Fitzroy, you would need to get more rainfall falling right across that catchment area and the heavy falls will be more coastal and perhaps the northern part of Capricornia," he said. "I would say it's an outside chance at this stage."